When you hit Baron you’ll be able to get the most fun ship in the game the Clipper!! The grind to get to Duke is heavy and annoying, but I suggest the system Wu Guinagi to get the Imperial rep. Almost every mission is just between there and HIP 10716, 11LY away. I'm CMDR Juzel Rix and I'll be serving as the coordinator for this little adventure in the SGN. Right now we'll be taking commanders from all platforms; PS4, Xbox, Mac, and PC. One of the biggest complaints and most frequent thing I always hear is how hard it is to get started in Elite: Dangerous, and how difficult it is to figure everything out. With such an expansive and open-world game it's not surprising that, just like the real world, you don't always know what to do next. - The Galaxy Map can be your greatest asset! Play around with the various filters on the right-most tab to sort by government (great for finding anarchy systems to bounty hunt in! ), allegiance (great for earning Imperial and Federal reputation), status, and more. - If you plot a route in the galaxy map you'll potentially see two lines; the solid orange one shows you where you can get on your current fuel tank, and the dotted one shows where you'll run out of fuel. You'll need to pack a fuel scoop, or be prepared to find a station to refuel! - Each type of module has its own perks and downsides. D-rated modules are the lightest, but lack strength, B-rated are the heaviest, but the second-best you can buy, and A-rated are the best all-around. 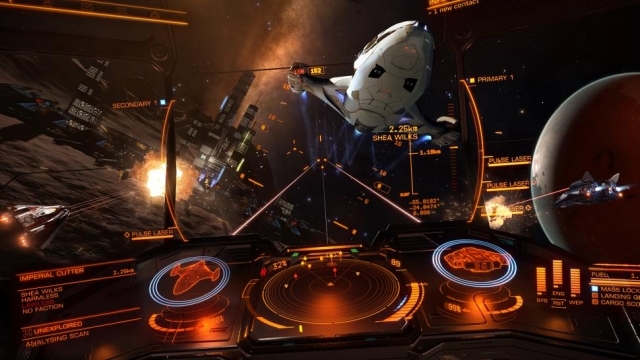 - Have an enemy knock out your FSD/sensors/thrusters? Check your right panel under 'functions' and reboot and repair! You're guaranteed to bring those three back online! - Don't be afraid to 'board hop'! FDev (Frontier Developers) don't consider this an exploit and suggest using it. If you don't see any missions at a station you want, just pop to the main menu and switch to Open Play/Solo Play to refresh your mission board. You don't have to stay once you accept a mission; you can easily hop back to Solo to complete anything you have accepted. Hello CMDR! I'm CMDR Juzel Rix in-game, and I'll be coordinating this little Elite:Stonewall group!